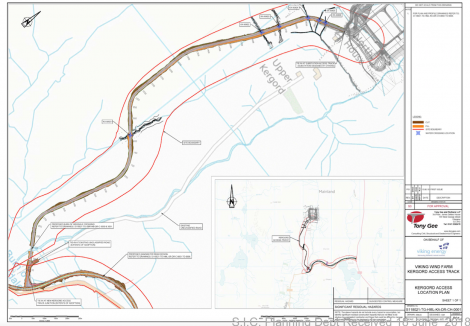 PLANS for a new two kilometre track from the B9075 road to Upper Kergord to allow access to an electricity converter station which forms part of a proposal to connect Shetland to the national electricity grid have been approved by councillors. The application from Viking Energy, which would give direct access to the planned high voltage direct current converter station at Upper Kergord, went in front of Shetland Islands Council’s planning committee on Monday. The plans would see a 2.09km access track constructed in addition to a new junction and temporary construction compound. A converter station at Upper Kergord forms part of plans for the proposed 600MW interconnector cable, which would allow large renewable projects like the 103-turbine Viking Energy wind farm to export energy to the UK mainland. The cable is dependent on the Viking Energy wind farm securing government subsidy in the upcoming contracts for difference auction. Planning officers recommended that councillors should approve the plans as concerns over the impact on peatland, the water environment and habitat could be “satisfactorily managed” with appropriate conditions. The application for the Upper Kergord access track is separate to related plans for a new road off the Sandwater junction at the Halfway House for construction traffic, with both forming part of the jigsaw for the Viking Energy wind farm. The Upper Kergord application received an objection from local campaign group Sustainable Shetland, as well as a local land owner. Sustainable Shetland had said that “combined with alterations to the B9075, the converter station and the Viking wind farm itself represent a massive industrialisation of the Upper Kergord area”. A report presented to planning committee members from council officials concluded: “It is inevitable that the construction of the access track will have an impact on the natural heritage and the ecosystems in and around the site boundary for the proposed development. The decision on the access track came shortly after councillors had closely scrutinised plans for a 12-turbine wind farm between Lerwick and Scalloway before ultimately approving the development with conditions. Viking Energy’s Aaron Priest, however, received a somewhat less prickly time as he answered a few questions from councillors. South mainland member George Smith queried who would be liable for maintenance of the track, with Priest confirming it would be Scottish Hydro Electric Transmission, which is leading plans for the subsea cable. There was no debate from the committee’s eight members and the decision to approve the plans with conditions was moved by Lerwick South member Cecil Smith and seconded by town councillor Malcolm Bell. Plans for the converter station have already received approval from the council.